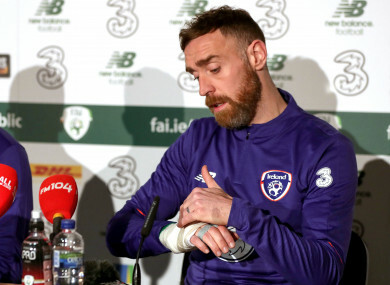 Richard Keogh discusses his broken hand at Irish camp today. USING THE PHRASE ‘trial by media’ is often the preserve of managers and footballers usually sullen with their treatment press, and while that can’t describe Richard Keogh’s attitude at Irish training this morning, he was nonetheless asked to raise his hand ahead of a press conference. Not that he was swearing on anything – it’s so we could all inspect his heavily-bandaged right hand. Keogh snapped a bone in his hand against Stoke City last week, but after seeking advice, is determined to avoid surgery and play on for Derby County and, most immediately, Ireland. “At first they were talking about surgery, I didn’t particularly want to do that. “When I spoke to [the hand surgeon], I said, ‘Listen if there’s a chance I can keep on playing I want to continue playing, if that’s at all possible. “I told him I don’t want to have surgery, I’d rather take a risk and crack on. He said we can do that. If it hadn’t been the middle of my finger which is protected by the other two, I might have had to have surgery and been out for a while. Sticking to a similar theme, Keogh said it was time that his teammates followed his lead and own up to the disappointments of 2018 and atone for them this year. “I think we can all hold our hands up to that. “As players, we have to take responsibility, we could have performed a lot better. I just think that whatever happened in the past is in the past now. “Obviously Mick has come in. He’s a fantastic manager, a fantastic guy. His record for Ireland and at club level is very good. “Walking into the group, there is a very good vibe, a very good excitement about it. Elsewhere, Shane Long has pulled out of the squad with a groin injury, with Millwall’s Aiden O’Brien called in as a replacement. He will fly in tomorrow. Conor Hourihane has also yet to join up with the squad, but it’s hoped he will join up with the squad later today. Shane Duffy and Keiren Westwood joined the squad yesterday evening after missing the earlier training session, while it’s expected that Seamus Coleman and Seani Maguire will train today having sat out yesterday’s session. In preparation for the surface that awaits them in Gibraltar, the Irish squad will train on the astro pitch at Abbottstown later today. Email “'I’d rather take a risk and crack on' - Richard Keogh to play for Ireland with a broken hand”. Feedback on “'I’d rather take a risk and crack on' - Richard Keogh to play for Ireland with a broken hand”.